A basic Google search includes a single word; when you include multiple words, the results page tries to include only web pages that contain all the words from your query, regardless of their appearance order on the page. If you type "Microsoft president" (without quotes) in the search box, Google will show pages containing both terms; not necessarily the president of Microsoft, but also pages where the president of some country meets with Microsoft execs. If you're trying to find matches for specific words, appearing exactly in the same order as your query, what you are trying to launch is an "exact word match" type of query. You can force Google to search for that expression by typing double quotes at the start and at the end of the word listing. 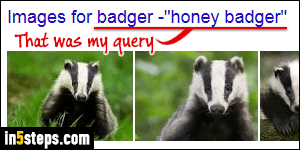 If you type "honey badger" and click Search, Google only returns pages that contain that exact expression. It will show matches in bold characters in site descriptions. You can just as easily search for multiple exact expressions: enclose each word group between double quotes, and separate each group with a space. Google will only show you as result pages that include both of these expressions at least once on the featured web pages. Look at the screenshot: both expressions show in bold letters in the results. Sometimes, Google will show the words matched, and add a strike-through-line for the unmatched ones. If you want to search for an exact expression which could have several variants, use Google's "or" operator, which can also be written as "|" (the pipe character symbol). Typing "United States holidays" | "US holidays", as shown on the screenshot, will return results for either expression. As in many cases, Google understands that "US" and "United States" are interchangeable, equivalent terms, and would automatically include both in your results. Finally, you can exclude search terms or expressions from Google results by using the minus sign. Any page containing the word or expression on the right of that sign won't be included in the search results page. Everything explained in this tutorial also applies to other Google search tools like Google Image Search, Google News, etc. Exact matches also work with restrictions, like searching for specific file types or only showing results from specific sites.